It’s a well known fact that “The Offer”, the first ever Steptoe episode was written as a one off comedy drama. It was only after it was broadcast that the BBC suggested it would make an excellent series. If you have never seen an episode of Steptoe and wanted one episode that summed the whole series up, it would have to be this one. Every aspect of the Steptoe characters we came to know and love is included. 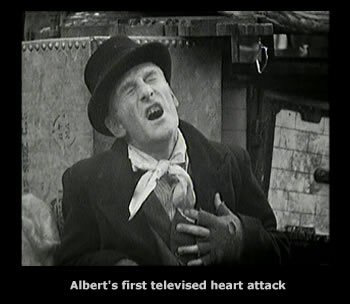 Harold’s belief that he is worth more, Albert’s desire to keep everything collected off the round for himself, the two arguing and blackmailing each other as each twist of the plot is uncovered, and of course it isn’t too long into the episode before Albert feigns the first of what would turn out to be a whole serried of alleged heart attacks. That doesn’t mean that Galton and Simpson wrote the same story week after week. It does show however, just how rounded and full their characters were. The story is a simple one, with Harold returning from the round. While father and son unload the cart, the pair constantly bicker. The old man is critical of his son’s abilities; to counter this criticism Harold informs his father that he has had an offer to join another business. 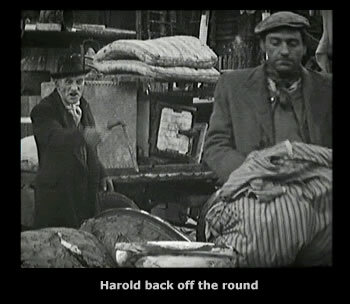 The episode moves on with Albert trying to convince Harold to stay. In the end Harold can take no more and decides to take the offer, however as we soon come to learn with Harold, failure is never far away. The programme was an instant success with the public and there are no doubt many reasons for this. The wonderful setting of the junk yard and the fact that the focus was on real people in real situations must have made it stand out from all other TV comedies at the time. In my view however it is the quality of the writing and acting which mark this programme as a landmark in TV comedy. While there are many great laughs throughout the episode, Harold’s despair at the end of the episode was real and therefore genuinely moving. Wilfrid’s playing of parental concern while Harold is with him, only to show scorn when he is gone, also demonstrated that for the first time our comedy heroes could also be people who at some level were not very nice people. A true test of the dramatic genius of the episode was when the BBC decided to make a radio version of the episode with different actors and no studio audience. This version is also set in the North of England, so that no vocal connections with the original can be made. The episode is of course funny, but it is the drama of the piece that really shows through. Steptoe and Son is about us, and all the nonsense we sometimes go through when we form a relationship with other people. The junk men had arrived. The Episode that changed the world of comedy.